This entry was posted on July 30, 2012 at 8:30 pm and is filed under Living Simply, Nature, Thirty Days of Grateful Praise. You can follow any responses to this entry through the RSS 2.0 feed. You can leave a response, or trackback from your own site. You and I must be sisters!!!!! ha…. I love flowers also—as you know, I’m sure… We love the ones in our yard —and we love to go places like Biltmore to see more of them. They just make me SMILE all over!!!!!!! Oh yes! Volunteer flowers are THE BEST! I love plants that require very little help from me. They make gardening that much more appealing. And what would the world be without flowers? I love flowers, too, but don’t have that success with them. Occasionally I have volunteers but not often enough to count on. I have roses, which require a good deal of work, but mostly I can do that standing up and not stooping. 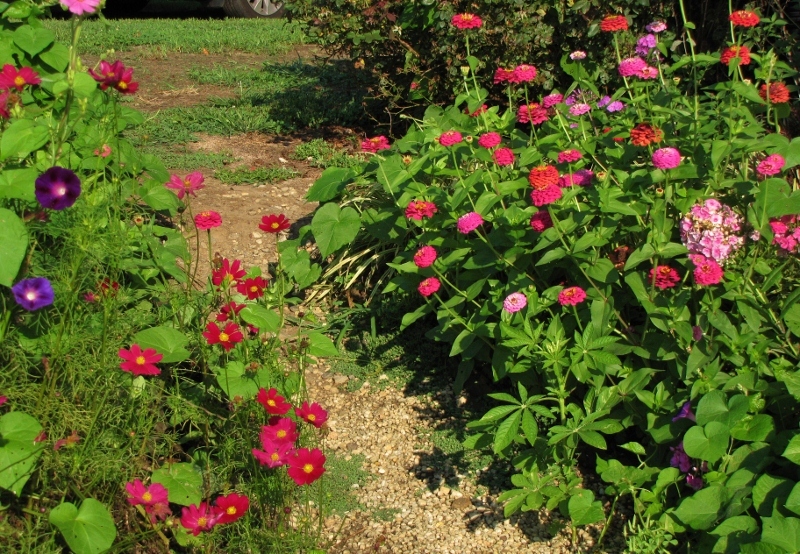 I would love a perennial garden that requires little care, though. Flowers that do all the work for me are a definite plus in my book. 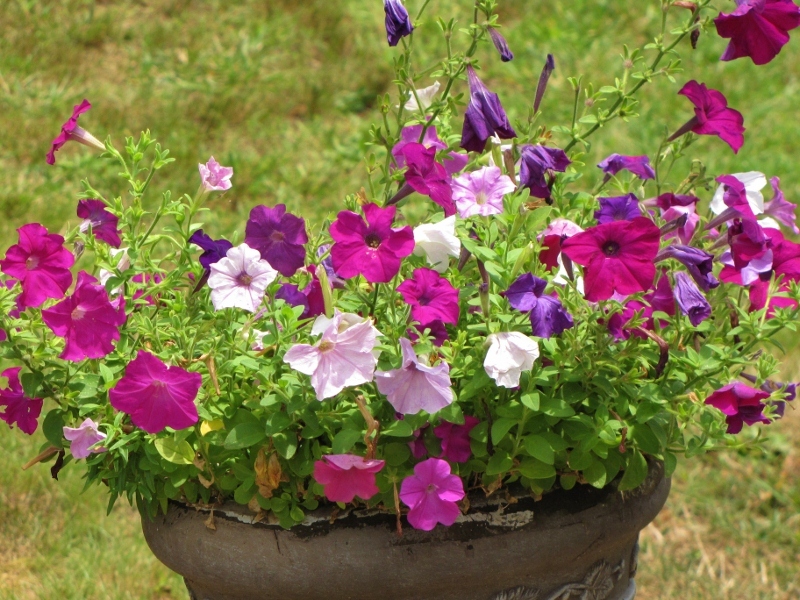 Love your blooms! I adore and applaud your approach and gratitude toward “happenstance” flowers! Love this, Beth. 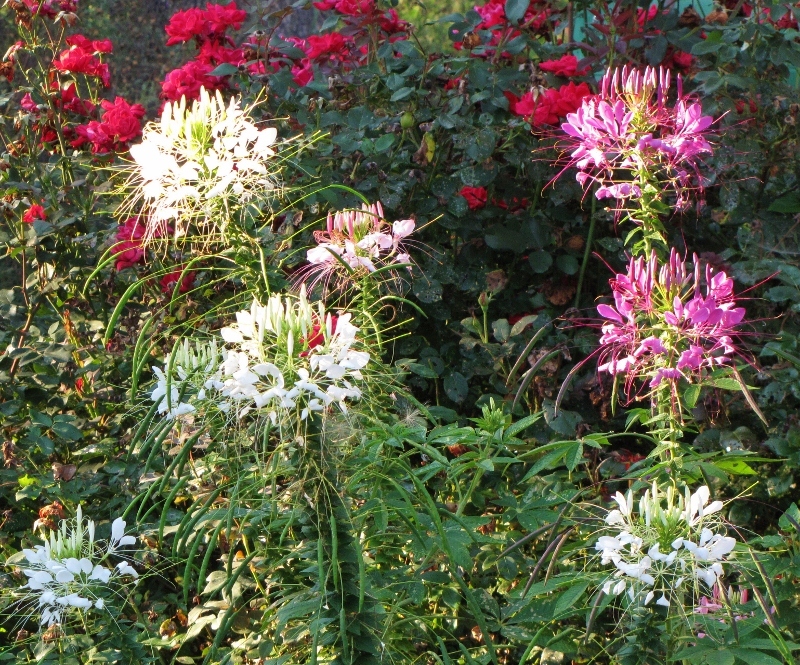 🙂 And the photo of the Cleome is wonderful; Cleome connect me with my dad … they were blooming with vigor in his yard the days of his passing and funeral, and I fell head-over-heels in love with them. Beth, we don’t have a lot of luck here in the desert with the kinds of flowers that I loved so much in our yard back in New Hampshire. However, hollyhocks here are a great success and I wasn’t able to grow them elsewhere. They happily self-sow and I’ve never had to plant any since the first seeds several years back. Our hollyhock “forest” is a stunner and stops the cars in the road now! I love visiting your garden. There are so many options out there that I’m completely overwhelmed .. Any tips? Many thanks! Hello, I am trying to get in touch with you. My Dad would like to inquire about purchasing the use of one of your photos possibly, of a honeybee on a peachblossom. It came up last year or so when I googled the subject. Thank you.